Remove your roast from the packaging and pat dry with paper towel. With a small sharp knife, deeply score the rind at 1cm intervals, being careful to not cut into the meat. 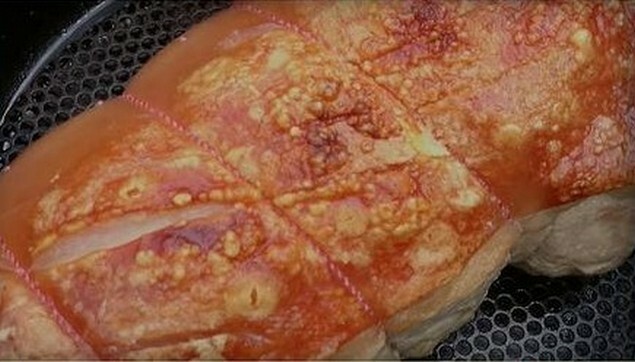 Place your pork on a plate and slowly pour boiling water over the rind. This opens up the pores and allows the oil and salt to absorb into the skin. Pour off excess water from the plate. Pat dry thoroughly with a paper towel. Rub the roast with 1 tablespoon of vegetable oil and half to one a tablespoon of salt ( to your liking), ensuring the oil and salt penetrate the scores. Place the roast on a trivet inside your camp oven with high heat coals, around 250 degrees with more coals on top and less on the bottom. Spread top coals to outer edge of lid after 20 minutes of cooking to stop the middle of the rind from burning. 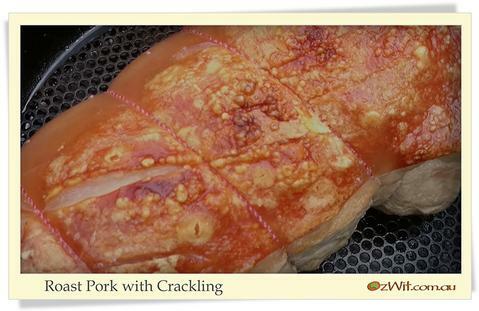 Cook at high heat for a further 10 to 20 minutes and check to make sure you rind is crackling up nicely. Once crackle has crisped, back off coals to medium heat coals of around 180 degrees and cook for 35 – 40 minutes per kg, depending on how well you like your roast cooked.